Looking for more info on Ben Folds' solo album and tour? Visit my new Ben Folds Pages! One of the Web's Top 10,000 Sites! Ben Folds Five were a trio (yes, a trio) from Chapel Hill, N.C., consisting of Ben Folds, piano, Robert Sledge, bass, and Darren Jessee, drums. Described as "Punk Rock for Sissies" by pianist/vocalist Ben Folds, the group played innovative songs with catchy melodies and soaring harmony, from jazzy palm-court arrangements to Little Richard-style rockin', using a unique guitarless piano/bass/drums lineup. Formed in 1994, the breakup of this groundbreaking band came in October 2000. 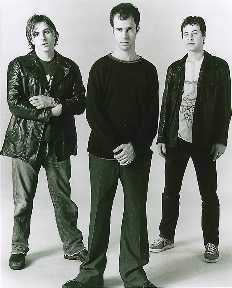 On these pages you'll find biographies of the band, a discography with lyrics and short samples of some of the songs, reviews that have appeared in various publications, an archive of tour dates, links to other Ben Folds Five resources on the net, and information on the Magical Armchair, the Internet mailing list. You will also find information on the solo work of the three individuals that made up Ben Folds Five. Now! As a service to visitors of these pages, we offer links on the Discography page for direct-to-your-door ordering of many of Ben Folds Five's titles from Amazon.com. You can also find Ben Folds Five songbooks at Sheet Music Plus. News from the press tour for the NBC-TV series The Sing-Off, held earlier this week, is that Ben mentioned he will be getting back together with Darren Jessee and Robert Sledge, former bandmates in Ben Folds Five, to record an all-new album later this year. According to Boston Globe music writer Sarah Rodman, the timeframe given was December, following wrapup on the TV show. When asked about potential touring, Ben was unsure, preferring instead to take it "one step at a time." First, however, he's producing Sara Bareilles' new EP. For the latest, follow the story on the main Magical Armchair page. The reunion concert from earlier this fall is now online. Visit http://www.myspace.com/fronttoback to view it. Yes, it's not a prank - the first reunion concert has been announced! Ben, Darren and Robert will be getting back together for one show only, September 18, at UNC's Memorial Hall in Chapel Hill. They'll be playing songs from TUBORM and who knows what else. Tickets go on sale September 8th. Hotel Lights, fronted by former BF5 drummer Darren Jessee, will release their sophomore album, Firecracker People, this summer. On sale August 19, the new album is a quieter, more introspective effort than the debut album. Guitarist Alan Weatherhead brings some of the Sparklehorse melancholy with him and helps underscore Darren's hushed side. Ben's brother, Chuck Folds, and his band Big Bang Boom, announce the release of their new album. Actually a children's music group, Big Bang Boom features Chuck on bass, Steve Willard on vocals and guitar, Eddie Walker on drums, and Snüzz on vocals, drums and miscellaneous sounds. Chuck says it's an effort to give parents a party option that's an alternative to Disney music and groups like The Wiggles. It's available now as a digital track download, with a CD release coming soon. More information also at Chuck's website. Hotel Lights will perform as part of this year's CMJ Music Festival in New York City. The show is Tuesday, October 16, 2007 at 9:30 PM at The Living Room, 154 Ludlow Street (near Stanton). There's also an article about Hotel Lights in the St. Louis publication Riverfront Times. HL will be performing at Off Broadway in St. Louis on Monday, October 22, 2007. Hotel Lights will play a private show for the Artists Den at New York City's beautiful Soho House on Wednesday, Dec. 13th at 8pm. The show celebrates the inclusion of the band's brilliant "AM Slow Golden Hit" on the recently released Artist Den's, "Volume II: Coming Into Focus". Ben Kweller will finish the night with a set at 9pm. Hotel Lights returns to New York City on Wednesday, November 1st to play the Bar/None Records CMJ bash at club Tonic! Other bands on the bill include Birdie Busch, The Split, Oppenheimer and Mosquitos. Hotel Lights goes on at 8:15pm sharp. Tonic is at 107 Norfolk St., in NYC, telephone 212-358-7801 or www.tonicnyc.com. An article in the Daily Tarheel, the UNC newspaper, discusses Robert's current activities as a bass guitar teacher in Carrboro, NC, playing occasional gigs, being with family and working on a startup band to be called Bob Sledge. There's also an article in the Chapel Hill News about Django Haskins' band The Old Ceremony, a hard-to-pigeonhole 8-piece group whose sound is a blend of jazz, blues, tango and pop. Haskins played with Robert in the group International Orange until its breakup in early 2005. Darren and his band, Hotel Lights, released their self-titled debut cd on Bar/None Records in March. Produced by Alan Weatherhead, formerly of Sparklehorse, the cd debuted at #9 Most Added at CMJ College Radio and the song "Follow Through" was featured in a recent episode of "Grey's Anatomy". The band has been touring the east coast, headlining clubs and playing gigs with Tift Merritt and Jennifer O'Connor. The tour continues into the midwest and northeast in August, playing shows with Chris Mills and Bishop Allen. Django Haskins, one of the members of the group International Orange, which counted as one of its members Ben Folds Five bassist Robert Sledge, has decided to break up. From Django's blog, via Eric Phillips, comes the statement: "Some of you may have heard that International Orange is no more. I just wanted to clear up the rumour here with the facts. The fact is, it's true - Int'l Orange decided to call it quits. It's also true that we're all on excellent terms and felt that this was the best thing for us to do at this point. It's entirely possible that we will collaborate in the future in different combinations on other projects - it's been an amazing experience travelling and working with these guys, and I know we all have a huge amount of respect for each other. So there you have it. We'll all be busy working on our various other musical adventures, and we'll try to keep the IO.com site updated a bit as to where to find us. Thank you for all your support - it's been a great ride." The band also has posted a bunch of new East Coast dates. If you can go - go and check the show out. You will not be disappointed. They're adding dates quite frequently so keep checking back at www.intlorange.com for any new shows. Eric Phillips talked to Britt Harper "Snüzz" Uzzell at the Bus Stop reunion show recently. (Bus Stop consisted of Snüzz, Evan Olson, Millard Powers and Ben's brother Chuck Folds.) Snüzz (guitar) and Robert (bass, of course) are joining fellow Chapel Hillbillies Django Haskins of Django and the Regulars, on guitar, and Chris Stevenson on drums. (Incidentally, Robert has done some mixing for Django's latest record "overeasysmokemachine".) The new venture is called International Orange. Three songs have been recorded by the band at Bobby Patterson (of DAG)'s home studio. Robert is mixing it and Snüzz said he was waiting to hear the final mixes sometime soon. He told me the band wanted "the word to get out" so here I am....helping spread the word. They have a lot of shows already planned in NC but they're a month or two down the road (middle of August or so is when they'll start). So if you're in NC (their first show is actually in Charleston, SC if I remember correctly...) you'll be able to check them out. He seemed pretty enthusiastic about the project and how things have gone so far. It'll be interesting to see and hear them live. Further updates: International Orange was to have been touring this fall, visiting New York, Atlanta, the DC area and elsewhere. The dates have been postponed. And Django wrote to say: "we're in the process of recording an ep right now, which will most likely include the sledge-penned tunes "tell me what i did" and "prince charming," as well as tracks written by me and snuzz. we're about to embark on a tour of the southeast and up to dc & nyc in november. tourdates and all that are posted on our new website, www.intlorange.com. thanks for spreading the word. we're hoping to do the midwest in the spring sometime. Darren's back with his new band, Hotel Lights. (The original band name, Remover, turns out to be the name of a band already in existence.) Joining Darren on vocals and guitar is drummer Mark Price, formerly with The Archers of Loaf, another Chapel Hill stalwart, along with Chris Badger on keyboards and Roger Gupton on bass. They played a few shows in June, in North Carolina, NYC and DC, and had several dates scheduled for November. Visit webring hq for more info! The Ben Folds Five Underground is in no way affiliated with Ben Folds Five as a whole or in part, their record company, or associates. Webring Five Star Site Award Winner! To e-mail the owner of this site, please see below. Underground: The Ben Folds Five Webring has no affiliation with any members of Ben Folds Five, their record company, or associates. You are visitor number to the Ben Folds Five Pages since September 15, 2000. Please support our sponsors. They support these web pages! These pages are Copyright ©1995, 1996, 1997, 1998, 1999, 2000, 2001, 2002, 2003, 2004, 2005, 2006, 2007, 2008, 2009, 2010 by Frank Maynard. These pages are written using standard HTML and can be viewed with any browser. Find out more about the move toward non-browser-specific code from AnyBrowser.org. Last updated August 3, 2011.